Finish your day as fresh as you started! 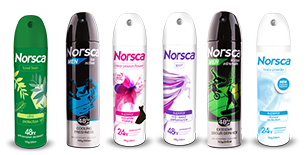 Norsca Anti-perspirant deodorants guarantee freshness so you can feel confident, fresh and revitalized all day long, no matter what challenges you face during your day! The secret to Norsca's freshness strength is our "actigard" formulation. In addition to providing protection against perspiration and wetness, the "actigard" formula also eliminates odour-causing bacteria to keep you feel Norsca fresh for a full 24 hours. 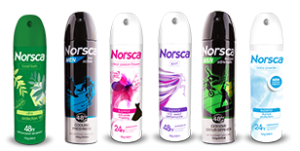 Available in a range of unique fragrances for men and women; Norsca Anti-perspirant deodorants combine cool, fresh, exotic and soothing scents to awaken your senses leaving you feeling refreshed and revitalised - ready to face the world. work as hard as you do, with refreshing fragrances that excite your senses!